Being gluten sensitive causes all kinds of stomach issues. Does not matter how careful I am I still get sick once in awhile. When I do get sick I try to stick to a bland diet for few days to help clear it up. I try to come up with fun things that are super safe and wont irritate my stomach anymore. I came up with this recipe on a whim and it was great. Start by sprinkling the chicken with salt and pepper and baking in the oven at 450 degrees until cooked all the way threw. While chicken cooks place rice in pot and add 2 cups water and broth cube. If you cant find the gluten free chicken cube then substitute water and cube for 16 oz of chicken broth. Heat liquid and rice to a boil and cover. Cook for 10-15 minutes and mix every few minutes until most of the water is absorbed and rice is soft. 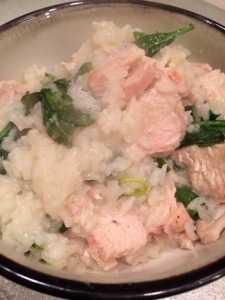 Then cut add baked chicken into small piece and add to rice. Finally toss in the spinach and mix well. Cook for another minute until spinach is wilted. Serve hot with some cracked pepper on top.